Thank you for Investing in the World’s First Complete Animal Communication Made Easy System! I am so excited to introduce you to the amazing world of animal communication. Below you will find all of the recordings, meditations, workbooks and Bonuses that were promised so you can start learning now! Start by reading the Read Me First document below! Optional: If you chose to get the physical Course, it is being shipped to directly to your door now. It usually takes about 1 week for U.S. orders, and up to 2 weeks for international orders. Be sure to whitelist our domain www.valheart.com so you will be notified of any upcoming coaching clinics or information that is ONLY offered to students who have invested in this Course. Files are provided to you in PDF (workbook) and mp3 (audio) format. The mp3 format was chosen so you can easily load the audio files onto your portable media player (such as iPod or Zune) for listening and viewing. If you need these files in a different format, we suggest you use a media converter service such as Zamzar.com. To save the files to your computer, put your cursor on either the image of the file you wish to download or it’s link and click the right button on your mouse* — clicking the left button on your mouse will only open the file in your browser — and select “Save Target As” on a Windows computer or “Save Link As” on a Mac. BONUS 3: Listen now to a previous Coaching Clinic! See what it’s like to receive Val’s personal guidance with other beginning students. In fact, some of your questions may have been answered here already! BONUS 5: Membership in Heart’s Friends AnimalTalk Members Only Group. It’s important that you have an understanding of the basics before joining us in the student Group. Please listen to the first 3 Classes now. Then you’ll be all ready to come play with your fellow students! Check your inbox and your Workbook for the instructions on how to Apply to Join the Heart’s Friend’s AnimalTalk Members Only Group! 2) Barometers of our Souls: Exploring the Mysteries of the Human Animal BodyMind Connection! 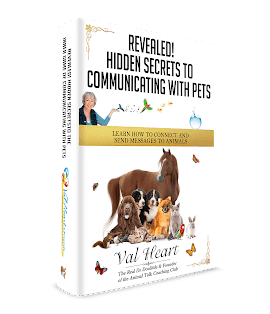 Learn The Hidden Secret that less than 2% of all animal lovers know anything about… the Deeper Truth to building a new level of communication and understanding with your animal companions! It is recorded so you don’t have to wait for a class to take it. CLICK HERE to find out more about it.